St. Francis of Assisi Catholic School is very proud of its Alumni. We developed this Alumni section on our website to help you re-connect or keep in touch with your alma mater and classmates. You can stay in touch with your alma mater and classmates. Add your information to our database. We will keep in touch with you and let you know about news and events. Submit your accomplishments and milestones to Alumni Notes. Share your news with your classmates in the alumni newsletter The Mustang Connection; graduations, births, career advancements, philanthropic efforts, etc. 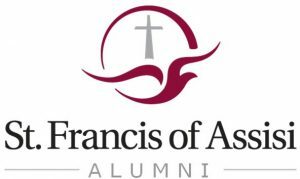 Join the St. Francis Alumni Facebook group (sign in to facebook first, then go to this link). Connect with fellow alumni. Help spread the word to other alumni. Please browse the various sections of our website. We hope you are reminded of your days spent at St. Francis of Assisi Catholic School. For more information please contact the Development Office at development@stfrancisa2.org or 734-821-2208.